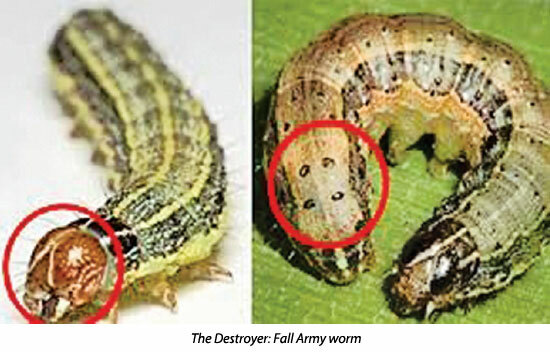 The Fall Army Worm (FAW) threat looms large in Sri Lanka. The larvae stage of the Fall Armyworm moth (Spodoptera frugiperda), commonly known in the country as the ‘Sena caterpillar’ has the ability to destroy hundreds of acres of cultivation overnight and could affect over 180 species of crops including paddy, maize, sugarcane, green gram, other vegetables and fruits. The caterpillar, native to the Americas was, first reported in Africa in 2016 and has since spread to over 40 African countries and devastated thousands of acres of crops. A severe risk to world food security, it prompted the UN Food and Agriculture Organisation (FAO) to invest more than nine million USD from its regular budget and to mobilise USD 12 million on FAW control programs. First reported in India in May this year, Fall Army Worm spread was reported in Thamilnadu, the Indian state closest to Sri Lanka in early August. Earlier in the month, the Ministry of Agriculture issued a warning to farmers in the North Western and North Central provinces about possible FAW invasion. Crop destruction had already been reported from Ampara, Anuradhapura, Polonnaruwa, Galgamuwa, Rajanganaya, Thambuttha and Gampola areas. 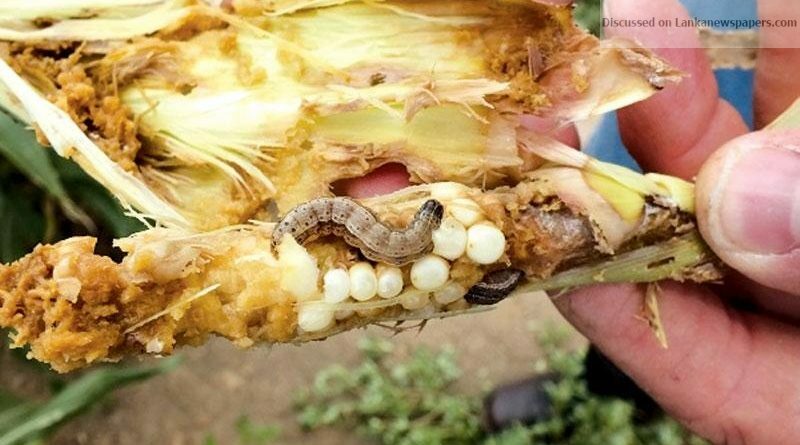 The Fall Armyworm (FAW) or Spodoptera frugiperda which is indigenous to the American tropical and subtropical regions, is an insect pest which has the ability of causing significant crop yield losses and threat to food security if not properly managed. It is not clear how it was introduced to Africa, but it is believed that it was through commercial air transport from America. This pest is considered to be impossible to eradicate due to a number of reasons. FAW favours maize, and the larvae are able to feed on more than 80 plant species that make up its food supply during the maize off season. They consume rice crops, cotton crops, sugar cane, and numerous types of vegetables. With the aid of air currents the FAW can fly up about 100 kilometres per night. Therefore, eradication of this pest is prohibitively expensive. FAW has the ability to adapt to different environmental conditions and climate change. This pest is wide spreading and invasive as it has a strong immune system. There is an inverted ‘Y’ in the head of the worm. At the rear end of the worm’s back are four dots aligned in a square. FAW’s life circle lasts from 20 to 40 days depending on the food consumption. This moth is nocturnal. According to Dr. Dayani Perera Additional Director of Pest Management, Department of Agriculture, Gannoruwa, Faw has the ability to resist pesticides so, the farmers have great difficulty in eradicating this invasive insect. One significant feature of FAW is, that after consuming the leaves, it crawls inside the shoot of the plant. Until the authorities find a proper solution, it is important to remove the worm with your hands, when you spot it on crops. Or else you can use the pesticides relevant to the Spodoptera insect species. It is essential to inform the relevant authorities if you find this pest in your area. The Department of Agriculture also has taken steps to educate farmers to prevent the spread of this worm. Scientists worldwide are experimenting on eradicating FAW. There are technical cooperation projects in several affected countries. They basically focus on monitoring and early warning, mass communication and awareness, elimination of highly hazardous pesticides, promotion of biopesticides, botanical pesticides and biological control. Additionally, these projects focus on socio-economic impacts and issues plus crop damage. From the onset of the FAW infestation, the Department of Agriculture has advocated for an Integrated Pest Management approach, supporting FAW management practices through technical assistance, awareness raising, communication and coordination, and capacity building. The Pest Management division is engaging with smallholder farmers to help them cope with this pest.